This paper will examine the efficiency divide between public and private markets, and explore how inefficiency in the private markets creates opportunities to earn alpha, or above-market returns. We argue that traditional public investments generally trade at higher prices than private market investments as a result of numerous factors, including greater liquidity, fewer opportunities for arbitrage, information transparency, lower transaction costs, and scale of competition. 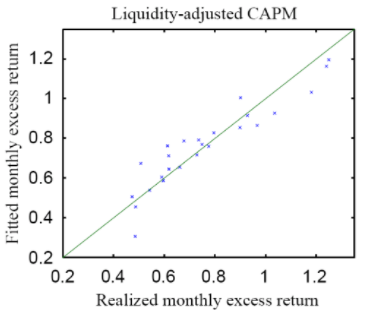 Concomitantly, a wealth of scholarly literature and empirical evidence suggests that, due to inefficiency-induced price discounts, “excess returns are fair game” in private markets.² This has profound implications for the returns of retail investors with traditional portfolios, and, in fact, is generally reflected in the standard institutional allocation to alternative investments. In economics, the efficient market hypothesis is used to argue that it is impossible to consistently “beat the market” for publicly-traded securities on a risk-adjusted basis, since public stock and bond prices fully reflect all available information. As a result, stocks and bonds always trade at their fair value, making it impossible for investors to either purchase undervalued stocks or sell stocks for inflated prices. As such, it should be impossible to outperform the overall stock market through expert stock selection or market timing. Put simply, when an asset is priced in the highly efficient public markets, it is theoretically priced perfectly. By contrast, private markets are notoriously inefficient, and hence offer investors opportunities to “beat the market”. To cite an example, the market for commercial real estate (CRE) is generally recognized as being highly inefficient, due to its relative illiquidity, unpredictable pricing, high transaction costs, geographical segmentation, and informational opacity. To quote a study conducted for the Real Estate Research Institute, “in relatively illiquid, segmented, and informationally inefficient CRE markets, negotiated transaction prices may vary from the ‘true’ (but unobservable) market value of the property.”⁵ In other words, while the efficient market hypothesis predicts that public securities will always trade at their fair market value, private market assets such as commercial buildings may trade for well below their true market values, hence providing an opportunity for investors to generate above-market returns. Private companies that elect to go public through Initial Public Offerings (IPOs) provide further evidence of the substantial pricing premia commanded by public securities. These premia are sufficiently large, in fact, that entrepreneurs are willing to voluntarily subject their companies to much higher regulatory burdens, and pay an industry standard underwriting fee of 5-7%, per PwC¹¹, to unlock them. As rational, profit-maximizing agents, entrepreneurs seek to take their companies public largely in order to fetch higher valuations than they would command in private markets. At initial public offering (IPO) the markets priced the Invitation Homes rental housing portfolio at $14 billion enterprise value – $6.3 billion in equity/market capitalization, which equated to $20 per share – a significant premium above the $6.36 per share value it achieved in the private market. 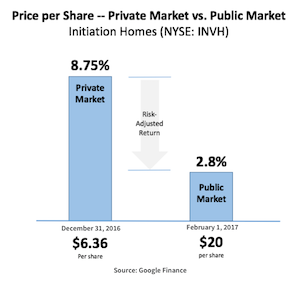 In other words, by taking Invitation Homes public, Blackstone was able to mark up their book value by 215% - or, conversely, the public market investor was paying 215% more for a share of the company than the private market investor. Blackstone illustrates the valuation benefits of capitalizing on the price differential between the private and public markets. With approximately $170 million of free cash flow (net income after debt service) as of 2016, the public markets priced Invitation Homes at a substantial premium above their private market basis. Source: SEC / EDGAR; Google Finance. The IPOs of Invitation Homes and its cohorts exemplify the pronounced pricing differential between public and private markets. By going public, companies are able to significantly boost their valuations over book – a benefit to entrepreneurs, but one that comes with profound implications for post-IPO, public market investors. While the valuation benefit to entrepreneurs of taking private companies public may be patent, so too is the downside for post-IPO investors in public companies, as higher valuations translate into lower yields. Moreover, it is virtually impossible for public market investors to avoid paying this premium, irrespective of whether they would be willing to accept reduced liquidity in exchange for higher returns. As the report concludes, “The evidence strongly supports the view that an allocation of 15% or more of a portfolio to private [investments] leads to higher returns and should be taken seriously by all investors.”¹⁵ We believe this statement is well founded. 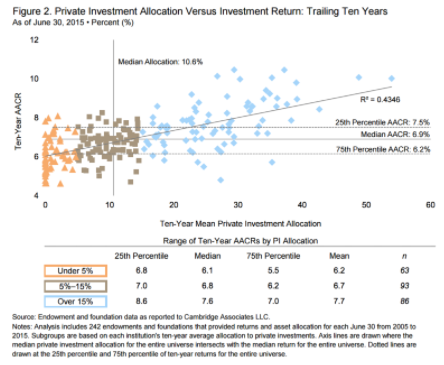 Extrapolating the median 20-year difference in annual returns observed by Cambridge Associates on an investment portfolio of $50,000, with $5,000 contributed annually over a 45-year period (assuming quarterly interest compounding) implies a portfolio value spread of approximately $4 million at the end of the period. A common misconception is to attribute the well-observed private vs. public return differential exclusively to private-market illiquidity. In fact, this misunderstanding oversimplifies the concept of liquidity and overlooks the manifold drivers that determine whether or not a market acts in accordance with the efficient market hypothesis. We argue that, in private markets, arbitrage opportunities, opacity, friction, and fragmentation take on distinct properties from illiquidity. As a heuristic, consider H2O at different energy states – its physical properties manifest as fundamentally different materials: vapor, water, or ice. Analogously, the general concept of liquidity is imprecise to describe the numerous factors generating inefficiency in private markets. We aim to demonstrate in the ensuing sections that public markets behave in accordance with the efficient market hypothesis by virtue of the fact that they offer investors greater liquidity, market-dictated pricing, information transparency, low transaction costs, and access to large pools of potential buyers and sellers. By contrast, we contend that private market inefficiencies – and corresponding return premia – are driven by their relative illiquidity, unpredictable pricing, opacity, high transaction costs, and limited numbers of prospective buyers and sellers. At its root, market efficiency assumes that investors have access to organized markets in which they may conduct high-volume and costless trades en masse. Once the frame of reference departs from the trade of public securities and applies to buying or selling whole companies or buildings, however, it becomes apparent that such access may be severely lacking, and, hence, that one of the central assumptions of the efficient market hypothesis has been violated. Many assets are traded both on illiquid and liquid markets. For example, real estate assets are illiquid when traded retail, liquid when traded as shares of real estate investment trusts. The assets of Ford Motor Company, consisting of auto factories, are very illiquid, but Ford stock is liquid. The principal asset of Microsoft is Bill Gates’ marketing ability, which cannot be directly traded at all due to the constitutional prohibition of slavery, but again, Microsoft is very liquid [...] Thus assets themselves cannot be characterized as to liquidity since they can be traded either directly on illiquid markets or indirectly on liquid markets, as securities, or both. Illiquid assets are heterogeneous. Unlike shares of stock, buildings and companies are not fungible, or perfectly interchangeable. Illiquid purchases imply a certain degree of irrevocability. Any attempt to reverse or quickly dispose of a recent acquisition results in high transactional entropy, and may risk transmitting market signals of seller distress, reducing the seller’s bargaining power. Assets are indivisible. Real physical properties and corporations are not easily divisible. This results in the need for buyers to operate at scale to achieve optimal financing, negotiating, and operating leverage. Pricing is highly reflexive. Private market pricing is exceptionally subjective. One buyer can achieve higher utility and economic rents based on leveraging its particular operational advantages. An analysis by Aswath Damodaran, Professor of Finance at NYU Stern, definitively states that “the illiquidity discount for a private firm is between 20-30% and does not vary across private firms.”²⁰ In effect, the public markets charge investors a 20-30% liquidity premium when they purchase shares. Importantly, this premium is charged irrespective of whether the investor is a long-term holder that does not need daily liquidity. In other words, an investor may be paying a substantial price premium for a benefit they do not require or demand. Paraphrasing Krainer and LeRoy, private market participants justifiably expect to affect the price and performance of assets acquired.²³ In contrast to public markets, price equilibria in private markets are not Pareto optimal. Both the buyer and the seller can gain positive net present value in a transaction. In fact, prices of the underlying assets reflect the imperfect pricing balance and directly imply that excess returns are fair game. While investors in the publicly-traded shares of large-cap multinational conglomerates are unlikely to see their returns bolstered or depressed by virtue of their neighborhood of residence, private market investors may feasibly benefit from a more intimate knowledge of their local market, as exemplified by the aforementioned study. Of course, geographical proximity is just one example of an advantage private market investors may leverage to boost returns. The ability to raise capital quickly and at scale, obtain low cost financing, and aggressively negotiate legal terms provide additional examples of factors that can exert a material effect on returns. The best private actors operate at economies of scale, with deep technical knowledge, and have many opportunities to translate management competence into investment performance. Importantly, this ability to leverage industry expertise is replicable across a host of private markets. Returning once again to private real estate markets, the sale of high-vacancy properties – typically purchased by buyers with deep industry expertise who believe they can boost occupancies and cash flow through superior property management, branding, and physical improvements (e.g. renovations) – have generated robust returns this cycle. Real estate data provider CoStar examined 44 million square feet of “turnaround” office buildings – defined as properties at least 30% vacant when acquired that were subsequently sold after vacancies were significantly reduced – generated average value gains of 33%.²⁸ While opportunities to turn industry expertise or managerial competence into above-market returns are virtually absent in highly-efficient public markets, inefficient private markets demonstrably offer opportunities for arbitrage – and alpha – among advantageously equipped investors. Related to the concept of arbitrage is market transparency, as a lack thereof enables investors to leverage an advantage of particular import: information. Generally speaking, better informed investors should be able to leverage their possession of superior information in order to generate outsized investment returns. However, the transparency of public markets limits the extent to which informational advantages in these markets can be translated into alpha. Theoretically, the average investor in public securities is trading at a significant knowledge disadvantage to professional investors and those with more intimate knowledge of particular companies, and should hence demand a return premium. 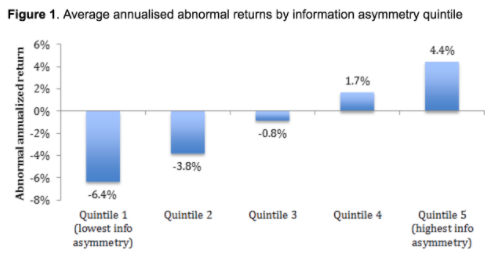 Nonetheless, there is scant evidence that information asymmetry manifests in return premia for less-informed investors in public markets. Again, real estate markets can offer a window of insight into the mechanisms by which information asymmetries may be leveraged to produce abnormal returns in inefficient, imperfectly competitive private markets. Information provided by sellers in real estate transactions can be suspect, and material provided by brokers may be grossly exaggerated. Private market buyers must perform their own in-depth due diligence, based upon information that is not made available to other market participants due both to its high production costs and precisely to preserve the buyer’s information asymmetry. Consequently, players with superior knowledge of the market and access to the resources needed to perform appropriate due diligence are able to generate abnormal returns. Evidence of this is offered by Ling, Naranjo, and Petrova, who find that “use of a broker significantly increases the acquisition prices of buyers and decreases the disposition prices of sellers,”³⁶ suggesting that better-informed market participants who do not need to rely on intermediaries are in a position to generate superior returns. Meanwhile, in Valuation in Over-the-Counter Markets, Duffie, Garleanu, and Pedersen (2005), show that the direction and magnitude of this premium is contingent on the quantity of prospective buyers and the size of search costs, ceteris paribus.³⁸ In other words, small buyer pools and significant search costs correspond with larger price discounts. To help illustrate this point, for many years on the NYSE, the price was set where the greatest number of trades between buyers and sellers would clear (i.e. a Walrasian price was achieved and the illiquidity discount would vanish). 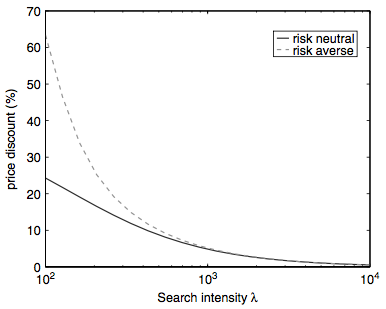 Contrastingly, search intensity is poor and highly frictional in private markets. For instance, an institutional commercial property sales contract is bilateral – between a single buyer and seller. Moreover, such contracts are latent with substantial uncertainty and may take significant time to close. According to CoStar, as of January 2015, commercial properties sat on the market for an average of 390 days before finding a buyer.⁴¹ The switching cost and bargaining power of market participants bring the search function described above close to zero intensity. Moreover, in practice, participants are neither perfectly risk neutral nor risk averse. Hence, it is fair to assume based on Duffie et al’s model that pricing discounts would range between 25% to 65%, depending on the risk sensitivity of the agent. To sum, numerous studies demonstrate that market frictions such as search costs can meaningfully impact investment prices and concomitant returns in private markets. 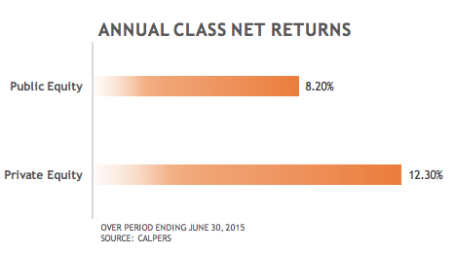 Another core driver of private market inefficiency and return premia is fragmentation. Typically, there are far fewer buyers competing in private market transactions than in public transactions, even when compared with an extremely thinly-traded public market. Investor Business Daily considers a stock to be thinly traded if fewer than 400,000 shares trade per day, based on a 50-day average.⁴⁶ According to the World Bank, which cites data from the World Federation of Exchanges, the total value of shares traded in 2016 exceeded $42 trillion domestically, and $77.5 trillion globally (in US dollars).⁴⁷ By contrast, domestic commercial real estate transactions in core property sectors totaled roughly $500 billion in 2016, according to data provided by CoStar to the National Real Estate Investor.⁴⁸ This substantial divergence in scale creates a fundamental price differential between markets. While investors generally cannot beat the market through traditional publicly-traded stocks and bonds, both empirical evidence and economic theory support that above-market returns are achievable through exposure to private investments. 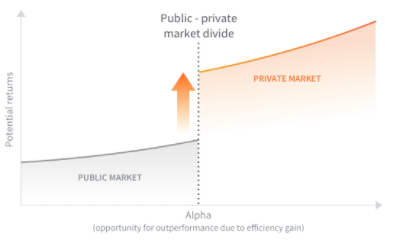 Private markets are inefficient – a product of their relative illiquidity, abundance of arbitrage opportunities, opacity, search costs, and fragmentation. In turn, private markets generate a typical pricing discount of at least 20-30%. We argue that by capitalizing on this spread – as institutional asset allocators have done for some time, and with remarkable success – investors can realize meaningfully superior returns on their portfolios. Damodaran, Aswath. “Private Company Valuation.” PowerPoint presentation. Krainer, John, and Stephen F. LeRoy. 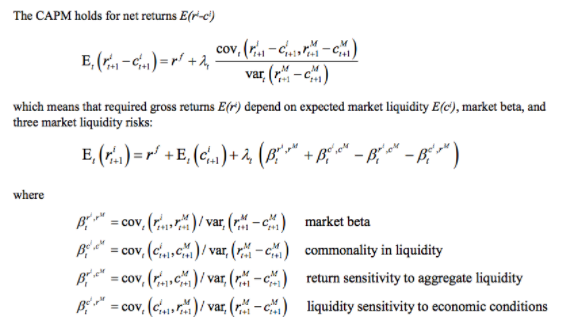 “Equilibrium Valuation of Illiquid Assets.” Economic Theory 19.2 (2002): 223-42. Malkiel, Burton Gordon. A Random Walk Down Wall Street: The Time-Tested Strategy for Successful Investing. New York: W.W. Norton, 1973. Ling, David C., Andy Naranjo, and Milena Petrova. “Search Costs, Behavioral Biases, and Information Intermediary Effects.” Real Estate Research Institute Conference (2013). U.S Private Equity Index and Selected Benchmark Statistics. Cambridge Associates, 2016. Lim, Dawn, and Heather Gillers. “Calpers Is Sick of Paying Too Much for Private Equity.” The Wall Street Journal 16 Apr. 2017, Markets sec. Dyck, Alexander, and Lukasz Pomorski. “Investor Scale and Performance in Private Equity Investments.” Review of Finance (2016): 1081-106. Yale Investments Office. 11 May 2017. The Yale Endowment. Yale Investments Office, 2016. Considering An IPO? The Costs of Going and Being Public May Surprise You. PwC, 2012. The 15% Frontier. Cambridge Associates, 2016. Benveniste, Lawrence, Dennis R. Capozza, and Paul J. Seguin. “The Value of Liquidity.” Real Estate Economics 29.4 (2001): 633-60. Marcato, Gianluca. Liquidity Pricing of Illiquid Assets. IPF Research Programme, 2015. Declaring a Major: Sector-Focused Private Investment Funds. Cambridge Associates, 2014. Heschmeyer, Mark. “Watch List: Investors Who Bought High-Vacancy Office Properties See Big Pay-Off.” CoStar News. CoStar, 11 Apr. 2016. Choi, James, and Hongjun Yan. “Information Asymmetry Raises the Cost of Capital for Corporations.” Vox. Center for Economic and Policy Research, 25 Jan. 2013. Berkman, Henk, Paul D. Koch, and P. Joakim Westerholm. “Informed Trading Through the Accounts of Children.” The Journal of Finance 69.1 (2014): 363-404. Coval, Joshua D., and Tobias J. Moskowitz. “The Geography of Investment: Informed Trading and Asset Prices.” Journal of Political Economy 109.4 (2001): 811-41. Lambert, Richard A., Christian Leuz, and Robert E. Verrecchia. “Information Asymmetry, Information Precision, and the Cost of Capital.” Review of Finance 16.1 (2011): 1-29. Williams, Joseph T. “Pricing Real Assets with Costly Search.” The Review of Financial Studies 8.1 (1995): 55-90. Duffie, Darrell, Nicolae Garleanu, and Lasse Heje Pedersen. “Valuation in Over-the-Counter Markets.” The Review of Financial Studies 20.6 (2007): 1865-900. Rafter, Dan. “CoStar: It’s Taking Owners Fewer Days to Sell Their Commercial Real Estate Today.” REJournals.com. 13 Mar. 2015. Gondo, Nancy. “How Much Volume Should You Look For In A Stock?” Investor’s Business Daily 02 June 2015. “Stocks Traded, Total Value (Current US$).” World Bank Data. The World Bank Group, 2016. Bell, Diana. “2016 Marked a Decline in Investment Sales Volume.” National Real Estate Investor, 26 Jan. 2017. Ciochetti, Brian A., and Jeffrey D. Fisher. The Characteristics of Commercial Real Estate Holding Period Returns (IRRs). Real Estate Research Institute, Jan. 2002.